Today marks the two year anniversary since Hurricane Sandy wreaked havoc on nearly every facet of my life. For me, Sandy meant many changes: leaving my apartment in Hoboken, N.J. and not going back for nearly a month; desperately trying to publish any and all Hurricane Sandy news from a bar because it was the only place for miles with power; severe damage to a shore house that was my home for 25 years; and the loss of my shiny new office in downtown Manhattan (actually, the loss of any semblance of an office for the next six months). And I was one of the lucky ones. Two years ago today, I left my office at the New York Daily News on a Friday. The news said that Hurricane Sandy, a storm unlike one we'd weathered in years, was coming. I figured I'd be back on Monday. Seven hundred and thirty days later, I have never been back to that office. Hoboken, N.J., lower Manhattan, and the Jersey Shore were some of the hardest hit areas, and they also happened to be the places I credit with shaping my life up until that point. For weeks after Sandy reared her ugly head, my life felt totally out of order, but in reality, it was nothing more than moderately inconvenienced. My story isn't the one you should focus on. Instead, you should hear the stories from survivors who lost literally everything, but somehow found the courage to rebuild their lives. Still, there are some important lessons I learned — both light and tough — from my experience. Here's what Hurricane Sandy taught me. In the week leading up to Sandy, I didn't encounter a single person who was worried about the storm or even believed the meteorologists. The superstorm ended up affecting 24 states, and left coworkers of mine stranded on the 7th floor when waves of water rushed into the lobby of our office. Thousands of my fellow Hoboken residents had to be rescued by the National Guard because the water was so high that they couldn't safely leave their homes. It felt like the sun wasn't shining for months after Sandy. The superstorm now stands as the second costliest hurricane in American history. While we can't forget the extensive damage or the dozens of nights without heat, we can at least be grateful for all the beautiful, non-stormy days since. Do you have a gallon of water and canned food stored in your home? An extra generator? The real question is whether hospitals, news organizations, and entire cities like New York City are prepared for the next Hurricane Sandy. Seriously. You'll thank me later. In the month following Sandy nearly every neighbor I had moved their stuff out, and then never came back. Entire roller coasters are not immune to Mother Nature's brute force. 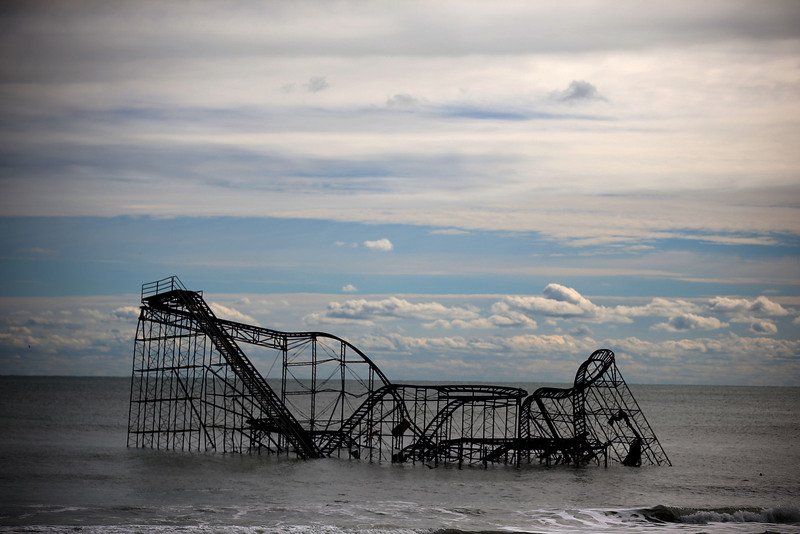 I had to drive down to Seaside, N.J. to see the JetStar roller coaster stranded at sea with my own eyes. It wasn't until that moment that it all felt real. I'd taken that roller coaster for granted for the previous 25 years, every single summer. And then it was gone — and so was the boardwalk. Local efforts like "Restore the Shore" popped up as soon as Sandy's flood waters receded. Neighbors bonded together down the entire coast to help those whose lives were even more damaged than theirs. Some removed debris while others helped people literally rebuild the foundation of their homes and their lives. Everyone affected by Sandy became a community in healing. As is walking to the bar with a lantern. Bonus points for the few hours you lived without a cellphone because it was dead. The things we lost, like 50 years of my family's history inside our shore house (seen here), are still, in the end, just things. The memories are something different altogether. This whole PATH-train-being-out-of-service-to-World-Trade-Center-every-single-weekend-for-all-of- 2014 thing is getting old. So many places affected by the storm wear this same "Sandy" badge, a marker of how high the flood waters were, and how much damage was done. This one still stands at the infamous Chicken or the Egg restaurant in Beach Haven, New Jersey. Unfortunately, my building, like many in Hoboken, never learned this lesson. Still, as I leave my apartment for work, I sometimes actually take comfort in that strange smell that sometimes permeates (okay, always permeates, when it rains) from the floorboards in my stairwell. It's a reminder of Hurricane Sandy and all the lives she wrecked, but it's also a reminder of how far we've come since. I'm so grateful to be one of the lucky ones who got to pick my life back up after just a few weeks and stay in my little, bustling town right outside New York City. For some, the 730 days since haven't been so easy. When I think past the physical and emotional rebuilding since Sandy, I realize I've done a lot of living in the past two years, and I'm sure you have too. I've fallen back in love, back out of love, filed my taxes twice, seen the Grand Canyon, gotten Shingles (that sucked), seen a dozen close friends get married, and been at my "new" job, this little place called Bustle (heard of it? ), for over a year. We didn't even exist when Hurricane Sandy struck. As a Hoboken, N.J. resident, a decent portion of my day is spent commuting into NYC. Even with entire train lines destroyed, road blockages, and billions of dollars in damage in the day after Sandy, life hardly skipped a beat in this area. Instead, we just commiserated in the two hour-long lines together, like any good disgruntled NYC employee does. And that's not even talking about the thousands who gave their time and bodies to rebuilding efforts in places like Breezy Point, N.Y. and up and down the Jersey Shore. We are tough as hell, and even Superstorm Sandy was no match for us.